Available in 5 Boots/Case. Order in full cases for added discounts. 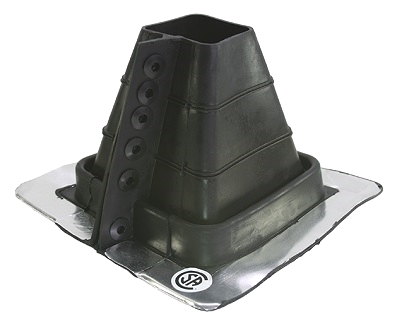 USE: Retrofit flashings (also called a split flashing/or split boot) are used in applications where you cannot slide the flashing over / down a penetration. The retrofit flashing is split which allows you to wrap around the roof penetration and form a permanent seal. Base: 8-1/8" x 8-1/8" square. Square tube / pipe / post. Square wood beam or post. Shingle and Tile (use with Eternabond Flashing tape).